Wearing an eye patch is one of the most common ways of treating amblyopia, also known as lazy eye, especially with children. There are two main types of eye patch worn – cloth or leather patches, which are usually strapped onto glasses, and patches with an adhesive border around the edges, which stick on, much like a plaster. The eye is one of the most delicate parts of the body, and given that the eye patch is kept in close proximity to it for hours a day, it is important to keep any eye patch especially clean. 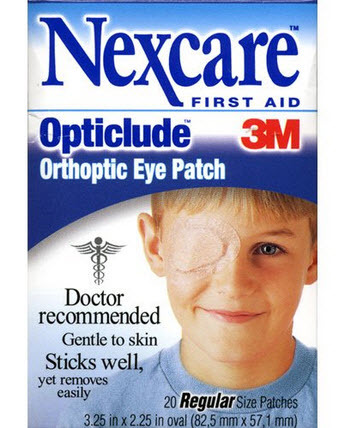 Orthoptic patches are usually a strange, almost trapezium-like shape with rounded edges, and can come with coloured patterns on the front while on the back is the adhesive. Similar to a plaster, these are usually disposable, as the adhesive will wear away after some use. If for some reason, the eye patch falls off, there is a possibility that dirt may get caught on the patch. If so, it should be brushed off, and any pieces stuck in the adhesive may be picked off individually. Naturally, some pieces of dirt may be too small to see or removed, so if the eye patch feels particularly scratchy after being put back on, it should be taken off and replaced. Ultimately, there are very few issues with this type of patch because they are disposable, meaning that if one becomes dirty, you may simply throw it away and replace it with a clean one. Cloth patches are usually strapped onto a pair of glasses, instead of the face. Despite this, they are still near the face and the fact that they are not disposable means that their cleanliness is of particular importance. After each usage it is recommended that the eye patch be washed in warm water and then left to dry. If for some reason, it becomes so dirty that soap must be used to clean the eye patch, it is important that any soap is thoroughly rinsed out afterward, as the eye patch will, naturally, be up close against an eye. If the patch is made of felt, then any fuzz that builds up should be removed, either by hand or by a battery operated cleaner. Special care should be taken when removing fuzz around the edges however so that none of the threads around the outside are pulled or cut. Leather patches work the same way as cloth patches, except they are made of a different material. Unlike fabric patches, they require no day-to-day washing. If a cleaning is needed, then they should be rubbed with a damp cloth. It is important that not too much water is ever used, however, as too much may damage the eye patch. It should be noted that some specialist kinds of leather, such as suede, may require specialist cleaning materials, but a damp cloth should suffice for regular leather. If the patch is strapped on with an elasticated band, then the band may be cleaned with alcohol gel or warm water, though care should be taken not to entirely submerge the band in water or gel; wiping with a cloth should be enough.